While many public health risks take turns dominating the media spotlight, influenza continues to be a very real risk for billions of people around the globe. While the most well-known influenza pandemic remains the world-wide outbreak of the disease in 1918, the World Health Organization (WHO) continues to explore and track incidences of this disease in an effort to avoid another outbreak. 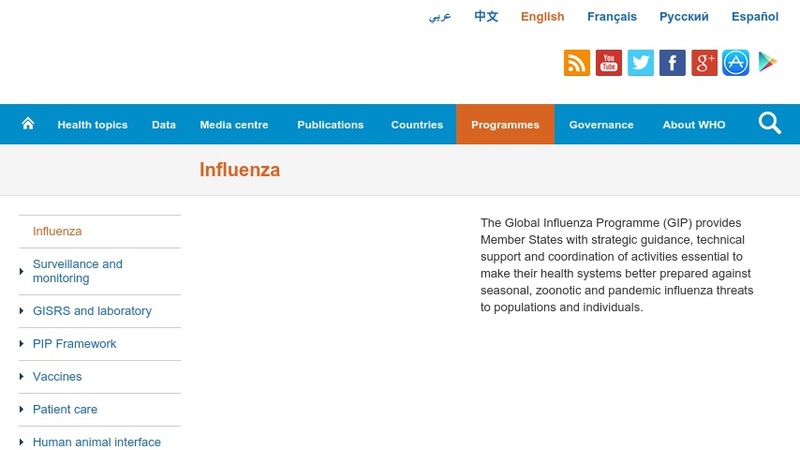 On the WHO page dedicated to this disease, visitors can read a factsheet about the disease, and also peruse the organization's mission statement and priority activities as regards monitoring influenza. The site also contains links to rather timely documents that include a set of policy recommendations for strengthening the response to pandemic influenza and also on the subject of avian influenza. Not surprisingly, visitors can also learn about the latest outbreaks of the disease as reported by WHO officials and correspondents.